Lactobacillus bulgaricus is a helpful natural bacterium, and a member of the family microflora, that can fight harmful bacteria that may invade your digestive system. L. bulgaricus is a specific type of micro-organism that is known as a probiotic. Probiotics are live microorganisms, which, may provide numerous health benefits, according to the Food and Agriculture Organization of the United Nations. L. bulgaricus lives in the intestinal mucosa, the mucous membrane that lines the gastrointestinal tract. L. bulgaricus is hardy enough to be able to withstand the acidic digestive juices secreted by the stomach. The organism grows when it’s needed and diminishes when it’s not. L. bulgaricus is called a symbiotic bacterium; it lives in harmony with the other helpful bacteria that normally live in your gastrointestinal tract. Here the micro-organism helps neutralize toxins and kill harmful bacteria by producing its own natural antibiotics. 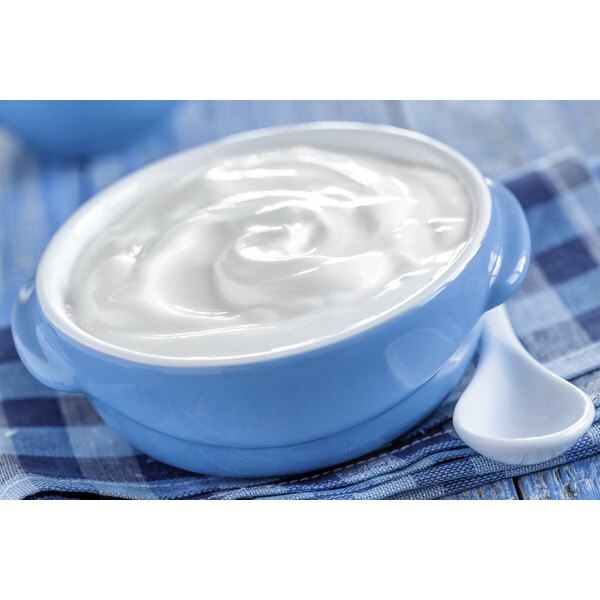 Probiotics, including L. bulgaricus, are found in certain yogurts, milk products, soy foods and beverages, and some juices. Probiotics also occur naturally in certain traditional Japanese foods such as miso, a seasoning prepared by fermenting rice, barley and soybeans, with salt and a type of mushroom, and in the Indonesian dish tempeh, a fermented soy cake. L. bulgaricus and other probiotics can also be purchased as capsule, tablet or powder supplements from health food outlets. In most cases, you will never need a probiotic such as L. bulgaricus because the helpful bacteria that occur naturally in your gastrointestinal tract, or gut, will be able to do the job they are designed to do--protect your digestive system. If, however, your native gut bacteria are overwhelmed for some reason, probiotics, such as L. bulgaricus can help repopulate your intestinal tract with healthy bacteria again. A balance of healthy bacteria is necessary to boost your immune system, protect against disease and aid in the digestion of food. When antibiotics throw off this balance by killing off the healthy bacteria in your gastrointestinal tract, or when harmful bacteria, yeast, parasites or fungi overwhelm your natural healthy micro-organisms, you can develop infections, diarrhea, irritable bowel syndrome, inflammatory bowel disease, stomach ulcers and other types of chronic stomach inflammation, tooth decay and periodontal disease, vaginal infections, stomach and respiratory infections in children, and skin infections. Most people can take probiotic supplements or add probiotic-containing foods to their diets. However, as with any dietary supplement, it is always wise to check with your doctor first. And never use a probiotic in place of regular medical treatment. Side effects of probiotic supplementation are usually mild and include gas and bloating, but probiotics could possible cause infections.